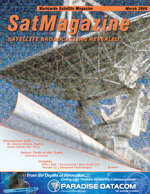 Welcome to this issue of SatMagazine — and to the National Space Symposium in Colorado Springs as well as the National Association of Broadcasters Military + Government Summit held concurrently with the NAB 2009 conference in Las Vegas, for which we are an official Media Sponsor. All of these elements strive to accomplish one major need for all — the delivery of timely and usable information to help you accomplish your goals within the MILSATCOM and SATCOM industries. SES Americom-New Skies to be renamed  Capacity demand remains strong. Technology pragmatism is clearly a stamp on todays competitive television environment. Much focus is often given to cross-platform moves made by last-mile distributors. However, the current situation of content abundance and bandwidth bottlenecks also has implications for wholesale players, some with satellite-based advanced offerings that intend to bring efficiencies to the food chain at the B2B level. In this category we find a number of players including Avail Media and EchoStar in North America, as well as those with regional scope in Latin America including IPTV Americas and Telefonica. As Euroconsult and many others in the industry have regularly underlined, TV broadcasting is the leading revenue driver for FSS satellite operators, with over two thirds of operators involved in distribution of TV channels. On February 2nd, 2009, Google did something that made its users see red. This reaction was neither the embarrassed states of its many corporate rivals, nor the rage of information privacy advocates, but instead the result of a new release of one of Googles most popular and acclaimed pieces of software, Google Earth. Tucked away in this shiny new version was a new feature sure to delight fans of planetary science and imagery ­­ at last, users had the option of viewing the planet Earth as well as the red planet, Mars. This article describes how the Arab States Broadcasting Union (ASBU) has become the first broadcasting union in the world to successfully migrate towards a full IP based integrated Radio and TV exchange system. The growth in the capabilities of the monitoring and control (M&C) solutions available for satellite network operators has been staggering over the last 10 years. M&C products originally designed to provide the operator with the ability to remotely control the stations uplink and downlink equipment for a single antenna from a PC rather than equipment front panels. For each antenna that was installed, a new M&C computer was put into the operations room to allow operators to control the equipment. This resulted in operators having to learn multiple M&C systems just to manage the equipment in their facility. Sustainability of the space environment is the responsibility of all actors in space, and only by working together can its benefits be assured for future generations. The foundation to this sustainability is international civil cooperation in and sharing of space situational awareness data. As the demand for fixed price broadband soars at sea, legions of VSAT providers are invading the maritime market with new services targeted at Inmarsats market. Gottlieb International Group is pleased to provide an overview of the new players, their services, their strategies and how they are likely to emerge as the new leaders in broadband maritime communication. This article documents the commissioning and build out, and especially, the advanced electronics, that will support the MSV Well Enhancer which was built for the Well Ops fleet, a Helix Company. The keel was laid and the vessel was built at the IHC Merwede yard at Krimpen, Rotterdam, in The Netherlands. The vessel, based on the Merwede Type-22 design, is a cost-effective, high performance and efficient vessel. Yoel Gat, the focus of this interview, is the Chairman and CEO of RaySat Broadcasting Corporation. This company was formed to work with AT&T to bring AT&T CruiseCastSM to market.Yoel is a well known executive in the satellite industry, having spent more than 16 years as co-founder and CEO of Gilat Satellite Networks, a leader in very small aperture terminal satellite (VSAT) communications. During Yoels tenure, Gilat experienced sales of more than $500 million in 2000 and held significant market share. Yoel also won recognition as an industry mover and shaker as one of Time Magazines Digital Dozen for 2001 by providing the capability of Internet-over-satellite technology on a mass-market scale. Since January of 2007, Drew Caplan has served as SkyTerras Chief Network Officer. You may recall the company was formerly known as Mobile Satellite Ventures. Drew is responsible for the companys network engineering and technology functions, as well as leading the development and deployment of the companys nexgen network. He is a 25-year veteran of the telecommunications industry, having consulted with venture capital and private equity firms interested in investing in telecom and technology companies from 2005 until 2007. Drew also served as Executive in Residence for Columbia Capital. The subject of this Executive Spotlight is Dr. Arunas Slekys. He happens to be both the vice president of Corporate Marketing and the vice president and general manager of the Russia & NIS Business for Hughes. In these dual positions, he is responsible for managing all of Hughes marketing communications and advocacy initiatives worldwide, along with overall P&L responsibility for the companys broadband satellite business in Russia, Ukraine, and the NIS (Newly Independent States) countries. From dial-up in the 90s to broadband connections in the early 2000s, and now to mobile satellite communications, Internet connectivity in the Asian sub-continent has evolved exponentially over the past decade. A growing demand for high speed Internet in the cities as well as in remote areas has led to an early penetration of satellite broadband in these countries. Today, most people cant imagine taking a road trip without a cell phone. What would happen if you got lost trying to follow directions, or ended up on the side of the road with a flat tire? Each scenario could be a problem if drivers didnt have at their fingertips the ability to call and speak with a friend who could get them going in the right direction, or for the assistance of a local tow-truck driver who could replace the tire. Given this reality, why would one fly in any aircraft without these same sorts of reassurances? Affordable technologies exist enabling every aircraft to be equipped with devices that ensure they are never off the radar and are in constant communication with those on land and in the air. Satellite, Cable, Telco or even free broadcast TV  how is a consumer to make the correct selection? Subscription cost is certainly a key factor, but if it were the sole criteria, the operator with the lowest monthly cost would grab the entire market. Instead, consumers look for features that provide genuine value to them. In a business where competitors all have access to the same media content the challenge is how an operator can bring to bear a distinctive value to the subscriber. This provides the opportunity for service operators to establish brand loyalty, especially if that value is unique to the operator. LBiSat has been a global provider of satellite-based telecommunications services to remote regions of the world for more than 25 years. In 1986, the company pioneered voice products using T1 lines. Since 1997, the Company has used the Internet to offer basic �dial tone� satellite services to its growing customer list. Satellite news gatherers are under constant pressure from consumers to provide up-to-the minute news coverage from across the globe. SNG equipment is becoming increasingly efficient and automated to meet with this demand. Often, SNG teams unknowingly are faced with signal black-spots, costing them valuable time and consequent loss of broadcast availability. This tutorial will present various methods of how to connect several Visionic stations into one single system and how to monitor and control such in the simplest manner possible. The Military  NGOs  First Responders  Government Agencies  all require secure and viable access to SATCOM solutions in order to respond to their crucial missions with success. Such is becoming increasingly difficult to ensure  SATCOM environs continue to change as new technologies and new processes are brought into play, capacity is hard to acquire, and increasing costs can play havoc with budgets. How can one update their knowledge as to these changes, quickly and effectively?